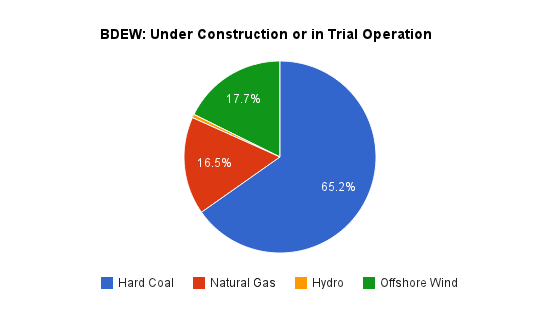 Industry group BDEW has released data, along with a statement, on planned power generation projects. Of the 37,755MW of capacity planned, by utilities and inclusive only of projects over 20MWe, 0 MW are solar, and 0 MW are on-shore wind. Germany's utilities have plans to build some 76 large power generation projects with a combined capacity of around 38,000 MW by 2020, the energy industry lobby group BDEW said Monday. However, due to unstable political framework conditions, the uneconomic outlook for gas-fired power generation as well as public resistance to new coal-fired power plants, almost a third may be cancelled, the BDEW said. "A new ice-age is threatening the construction of new power plants," BDEW chairwoman Hildegard Mueller said in the statement. "In particular, plans for projects beyond 2015 have been put on hold, even if they already have the necessary permits. Almost a third of all projects now have an unclear timing as investment conditions are currently just too uncertain." 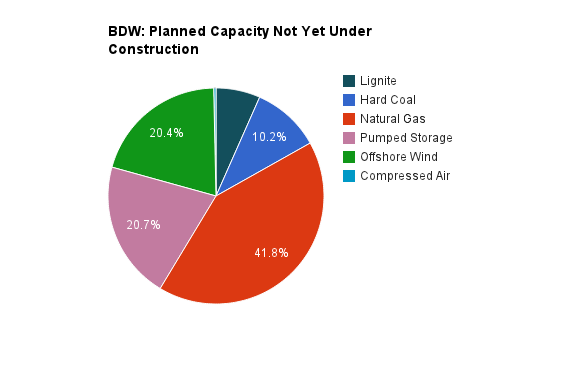 The planning for the other 70% of the BDEW capacity plans - the ones not yet committed to - have a much different composition than the projects being constructed (65% coal). 83% of the plans are for the wind/storage/gas combination frequently pictured as the future. That's certainly questionable, as the economics for natural gas plants are so poor EON is looking to close a natural gas-fired power station that only entered commercial operations 3 years ago (here). "In the short term will go though several new conventional power stations and offshore wind farms to the grid makes the capacity situation is temporarily better, but as of 2016 have the power plant design work to clear this will therefore bring no lasting relaxing effect for the market and security of supply we.... but need further secured capacity to compensate for the fluctuating input from renewable energy sources when necessary." The BDEW message seems to be that if the next German coalition government wants offshore wind, and support for the small-scale solar and onshore wind projects that continue outside the sphere of these BDEW figures, offshore wind needs to be made attractive (probably by the government picking up the tab on connection), and capacity payments need to be initiated to allow profitability for the natural gas-fired, and I assume the pumped storage, facilities.